On Father's Day this year, I visited Strauss Tobacconist in Florence, Kentucky. It was a quick visit and I was looking to use some Father's Day dough to get a new pipe. 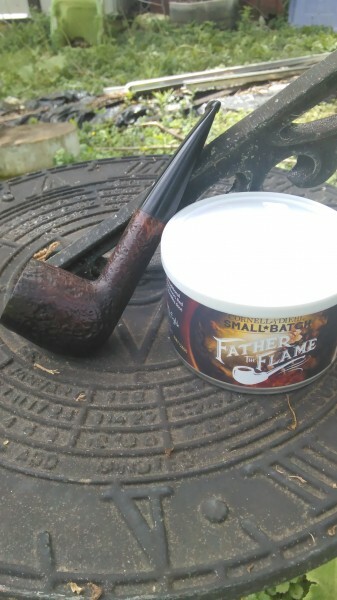 Although I did not find a pipe that I wanted, perhaps because I am far too particular, I did find a tin of Father the Flame. I had recently looked at the trailer for the upcoming documentary and was interested when I saw it. Got home later that evening and smoked a bowl out of my rusticated Baronet Bruyere. I love this stuff. I wanted to try something more pure and this straight English was very enjoyable. It smoked well with no relights necessary and provided a very cool smoke. Anyone else try this of late? I have one unopened tin to sample later. I have one of the Father The Flame commemorative pipes that Chacom donated to the project as a fundraiser. They were selling them at the Chicago Pipe show. Nice classic small bulldog that Chacom reportedly had made in the 1950s from Algerian briar. Of course, with a cool Father The Flame stamp on the shank. Has a stinger. I'm still breaking this one in as the bowl was bare briar with none of that newfangled coating or Dr. Grabow-style presmoking. I plan to buy a tin of the tobacco and also pre-order the digital copy of the documentary, which would get my name added to what I'm sure will be a lengthy set of credits. craigintheorn, this is awesome. I will definitely donate and get the download. As of now there are only about 25 pipes left. I'm not sure if I'll get that far into it, but what a great cause. Picked up ten tins when it was released. Nice balanced blend without being a lat bomb. I will if you will, I need someone to egg me on. And I have one in the cart. Have to be good. Spent WAY too much money this month. If that was a zulu or a yachtsman, I would have posted after purchasing though. I am working through a tin right now of the Small Batch "Straight Up English", which I take to be the same blend but released back in February 2016. I also love this stuff. Not quite sure what the allure is, but I just keep gravitating to it. It is an excellent blend when I first wake up with a cup of coffee. I can't remember how many tins I have in the cellar, but I've got enough to last me a while. I also recommend folks give this blend a try. Does anyone have any advice on when this blend would be at the perfect age, or should I just pop the top already? I would assume the virginias will continue to develop quite a while, but when will the latakia start to fade? FYI I only bought one tin..